When I think of my grandfather, some scenes linger like the scent of cologne in an empty room. He dedicated his life to military service, and, in retirement, he became a renaissance man of the working class. His scent was all oil cans and sawdust, leather tanner and garage grit. The walls of his home in Salisbury held a collection of traditional bows that we intended to shoot together. Someday. He was willing to teach me. I wanted to learn. But we waited too long. And it’s difficult to release the sorrow. When my grandfather died six years ago, I was pregnant with my first child, a son. I named him Archer, in homage, and I inherited a collection of vintage bows and a container of arrows fletched by my grandfather’s hands. I am the granddaughter of an archer, mother of an Archer. Yet I don’t have anyone to show me how to shoot a bow. I’ve been told to follow the creek to find Nathan Roark’s homestead. When I reach his holler, not far from my hometown of Boone, pasture turns to forest. I find pigs foraging in the understory, chickens roosting in trees. When my tires cease grinding gravel, Nathan emerges from a rough-hewn building to greet me. Nathan and I share many mutual friends, which is how I discovered that he’s a great local bowman. He’s been shooting since he was 4 years old, and he calls archery one of the great loves of his life. 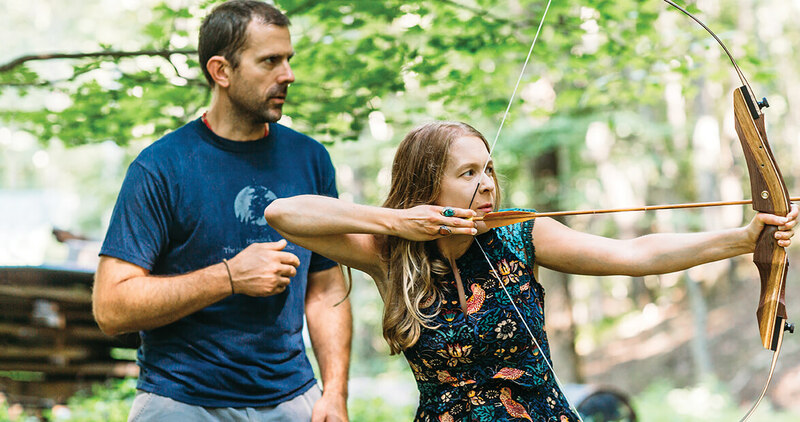 When Nathan’s not hunting or farming to cultivate a subsistence lifestyle for his family, he runs Buffalo Cove, an outdoor education center, where he’s also an archery teacher. He knows what it means to be a mentor. Today, he’s agreed to be mine. His attention, his singular focus, is so sharp that talking to him feels like standing before the point of a flint-knapped arrowhead. He’s a slender man with closely cropped hair. The tip of a deer antler hangs from his neck. His property, a steep mountainside, is dotted with targets — some suspended with string, others precariously balanced on uneven ground. Nathan inspects my grandfather’s 1950s-era bows, stowed in the back of my station wagon. I’m right-eye dominant. My grandfather shot left-handed. I have a decision to make. Do I attempt to use his left-handed bows, or do I shoot according to my natural leaning? Ultimately, I decide to let my eyesight dictate. This means the bows I’ve been carrying for years — talismans of my grandfather — will not actually work for me. But it’s the practice, not the object, that’s important. I bear my grandfather’s name. So does my son. We’re bows sending forth arrows. Archery is a living tradition. Regardless of whether my aim is true, each time I let an arrow fly, it feels like I belong to an unbroken human lineage. When he says that, I understand that my interest isn’t just about continuing my grandfather’s practice. It’s about connecting with the place I live; I’m drawn to the primal side of archery, just as I’m drawn to wild spaces. My grandfather used sighting pins. I’m going rogue. Because for me, this is also about learning how to move through Appalachian woodlands with intent, like The Hunger Games’ fictional heroine, Katniss Everdeen. After all, western North Carolina served as the real-life backdrop for the movie version of her home. 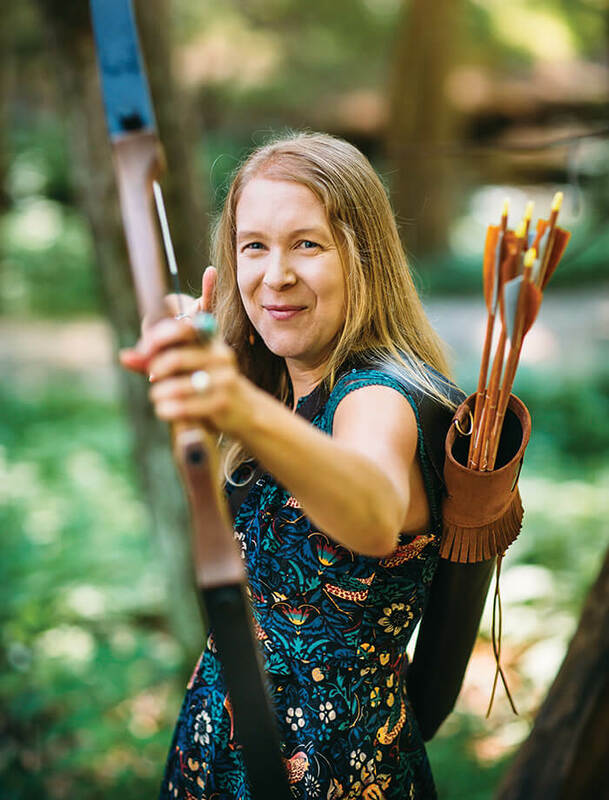 Archery is present in cultures around the world — in daily life, in the complicated plotlines of global mythology. 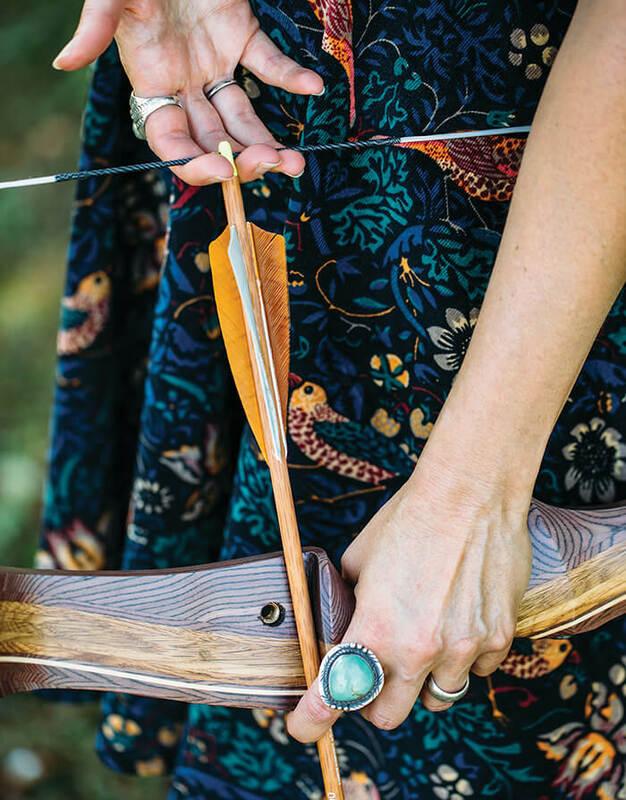 Bows and arrows have provided nourishment for mind, body, and spirit to each community, each era, in its own way. For Nathan, who often harvests the food his family eats with his own hands, the story always gravitates toward hunting. “Traditional hunter-gatherers, all they did was look death in the face,” he says. “We’re still hard-wired to look life and death in the face.” In this way, bow hunting honors the cycles of nature by connecting us to them. My grandfather was a hunter, but I was a vegetarian for 12 years. Could I hunt? Would I even want to? I don’t have answers for those questions yet. All I know is that I’m about to participate in an ancient ritual, one that dually celebrates and mourns my own beloved ancestor. Nathan’s teenage daughter uses a right-handed traditional bow. She’s offered to let me borrow it for the day. Nathan points out the bow’s parts: the ears, arrow shelf, and nocking point. He explains that, traditionally, all arrows had a design crest. Subtle differences in the craftsmanship meant hunters could figure out whose arrows were lodged in a buffalo or deer when dozens were flying. 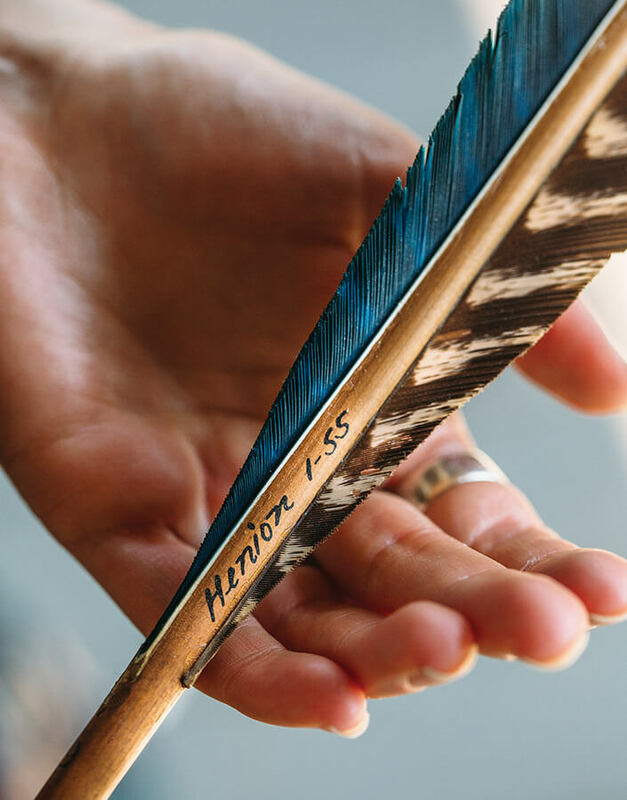 I tell him about my box of arrows, my surname pressed with pen in my grandfather’s script: Henion. “That’s your crest,” he says. Nathan hands me two arrows and slings a full deerskin quiver onto his back, leading me to one of the target areas on his land. I use three fingers, as he’s shown me. I shoot. My arrow hits center. I’m what you might kindly call a nonathletic person. But I’m not bad at this. “It’s in the blood,” Nathan says. I’m reveling in a sense of satisfaction, but I’ve also felt the bowstring’s sting. I locked my elbow, when I should’ve let it bend. I have thin skin. You can trace blue veins like rivers on my inner arm. There, a mark is reddening. We walk across a small wooden footbridge to retrieve our arrows. The slope doesn’t get much sunlight, and it’s still covered in last fall’s debris. Below us, water trickles over sharp stones destined to be smoothed by the unrelenting stream. I think of how many things in life are like this, and try to relax. By the time I pack up to leave, I’m feeling as bold as a modern-day Artemis. But when I ask about equipment, Nathan doesn’t tell me to arm myself like a goddess of the woods. He suggests that I purchase a children’s bow, and start from the beginning. My beginner longbow arrives within days. I store it with my inheritance. Increasingly, I walk away from my computer. I step out of my house — into sunlight, onto soft dirt. I hear the hum of insects, and absorb all the life that summer offers. I shoot as a nearby field grows waxy corn husks. I shoot when the field has transformed into a sea of rattling stalks. I shoot until everything is plowed under, to let the soil rest for a season. The 50-year-old apple tree in my yard blooms and fruits until the ground underneath it is littered with fallen apples — too bitter to be enjoyed without cooking. Their bee-charming smells slowly morph into a vinegar stench. All the while, I’m cycling — bow to arrow to target. Over and over, until my too-smooth fingertips become callused like my grandfather’s. In time, I start paying attention not just to where my arrows go, but also to the wisdom of instinct. If I think about what I’m doing, I inevitably miss. It’s only by shedding my mind’s everlasting chatter that I’m able to reach my target. I loosen my elbow, and bend my knees. I pose like I’m ready to pounce, in what I’ve come to think of as my natural stance. Regardless of whether my aim is true, each time I let an arrow fly, it feels like I belong to an unbroken human lineage. And in my beloved mountains — in my very yard, where I once found a thousand-year-old arrowhead embedded in the earth — I’m part of the whole. Alert as a hunter, ever searching. One afternoon, I’m down to my last arrow, when I hear a turn of gravel to my right. It’s a deer, galloping as if she’s being chased by an unseen foe. When she sees me, she stops. Right in the middle of the road. Not more than 15 feet away. For a full minute, we study each other, unmoving. If I were to draw the bow in my hand, my arrow might find her. I could nourish my family with just a slip of wood and a bowstring. But my practice arrow’s point is dull. And my bow doesn’t have a heavy draw. It’s intended to pierce plastic, not velveteen flesh. Its function is symbolic. The deer’s black eyes lock with my blue ones — the same sky color as my grandfather’s. There is nothing standing between us. She is a mother, I know. I’ve seen where she beds down in the woods not far from here. The imprint of her warm body and that of her fawn’s are pressed into fallen leaves that, in the darkest pockets of night, camouflage their skin. This animal and I know what it means to experience the sweet, too-fleeting comfort of generations gathered. An acorn falls from a nearby tree, startling us both, and the deer is gone. Alone again, I hold fast to my bow. I focus my target arrow. And, in the fading light of day, I let it go.